KawiForums - Kawasaki Motorcycle Forums > Super Sport > ZX-7R & ZX-9R > ZX-9R > Installing the ZX9 engine in my ZX7 frame - problem! Installing the ZX9 engine in my ZX7 frame - problem! I have fastened the lower rear engine mount, and begun to raise the engines front up against the upper mounts, when...the engine gets in contact with the frame! No one here have done this 9/7 swap on a P model ZX7R? 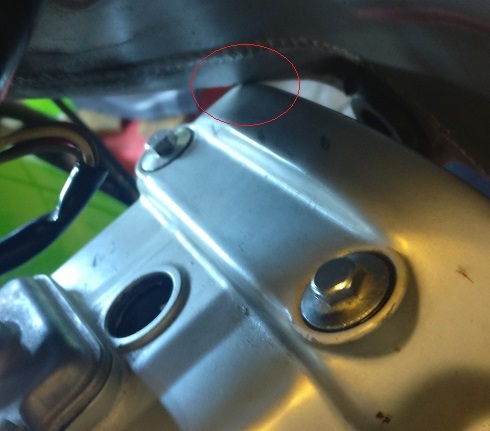 "..If you don' t want to go the BRG route, you can get around the front engine mount problem by wittling out the other engine mounting holes on the engine, this will give enough movement to install all the mounts on the standard frame. Second up is the oil delivery pipe to the cylinder head. This will require a little frame modification in order to clear the banjo bolt. Third up is the airbox, in order to use the 9r carbs try to get hold of a 9r B base for the airbox, the carb mounting face is then cut out and plastic welded (using soldering iron) into the base of the 7r airbox. this allows the use of 7r airbox with filter and ram air tubes." The main issue though, is to be able to rotate the engine when it is inserted in the frame opening. To get the lower mounts on the engine and frame to match, the engine has to be rotated forward. How the heck is this to be done when the engine is placed on a jack?! Tilting it forward or backward is no problem...but rotating?